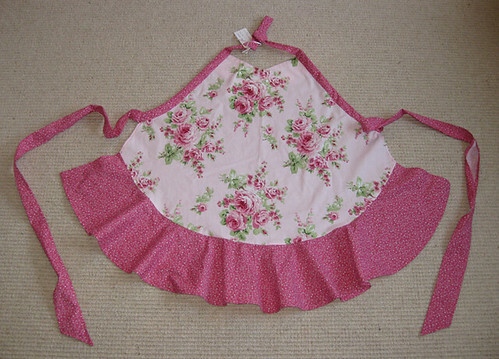 For my Mother In-Law's Birthday I made here a lovely apron in a floral fabric she chose. It was Butterick B4945-- also known as the first pattern I ever threw out. The curved ruffle and curved side edging was a little frustrating (I hate sewing curves! ), but the worst was where the side ties join the apron and are supposed to be covered by the side edging. Whoever designed this pattern wasn't thinking when it came to this part. The side edging is supposed to hide where the tie joins in but it was not so on the bottom edges of the ties. Another issue (which is easily fixable) was that the waist ties were 10 miles long. They would drag on the floor for anyone shorter than a basketball player who was wearing it! I tripped on them once carrying the apron around the sewing room. Lastly, the apron involved hand slipstitching the side edging closed on the wrong side of the apron. Some people love hand sewing, but I love my sewing MACHINE. My Grandma gave me great advice when she said if a pattern is bad, don't keep it -- throw it away!! Other than the frustrations and the finishing issue, I think it turned out well. But in the future, I'm going to give the Emmeline Apron pattern a try! *The light pink floral is from Freespirit's Barefoot Roses collection.